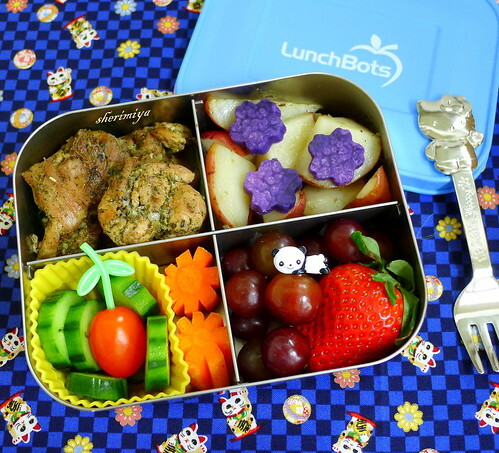 Herb Chicken and Potatoes LunchBots Quad Bento, a photo by sherimiya ♥ on Flickr. Oh yummy! I will have to try that out! I hope you like it Jenn! This one makes me think to scale it up and feed it to my fella! It's practically his ideal dinner meal in miniature. I made him his first bento last week, big hit. :) Your colors are beautiful. That's great!! Welcome to bento for you! So yummy and cheering, hooray! Have you posted your pickle recipe before? I tried (and failed) to find it in the archives, and they always look so yummy I would love to try it out :). Sorry for the delayed response. There are so many ways to make quick pickles! 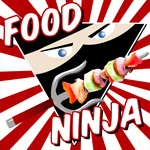 You might start with 1/2 cup rice vinegar + 1/2 cup water + 2 or 3 T sugar + 1 tsp salt. Whisk all together and pour over sliced pickling cucumbers. Adjust the salt and sugar to taste. You can also add spices like red pepper or dill or even shiso. The pickles should be mostly submerged, but will shrink. Keep in the fridge for several days, if they last that long. Also add other vegetables like onion and bell pepper. Maybe I should do a post on this! Thanks for sharing, I'll be trying this as soon as I get my hands on some pickling cucumbers :). I've used the smallish ones, the long narrow English cucumbers, and the Persian cucumbers. They all work well. Yay! I've been looking for your pickle recipe too. Thank you for putting it up - my kids are going to love these!